The public transport industry is a heavy innovator. Trains and railways are equipped with IoT sensors to measure performance, delays, and incidents. Bus, subway, and train repair, and maintenance costs are intensely watched due to budget pressures. In the meantime, passengers are more critical and demand immediate action whenever downtimes or delays occur. In various interactions with public transport industry customers, I’ve noticed they are generally well informed regarding delays, have good insights on maintenance and repair, maintain remote visibility on infrastructure incidents, and are equipped with rolling budgeting models. The thing is that these insights tend to be isolated. None of the customers I spoke to has integrated and consolidated insights on them all, so they are like “blind men in the wood” when I ask which unexpected repair incidents affect which train delays. · Incidents management: including both infrastructure incidents and incidents in the actual train, bus, subway, and so on. · Repair costs and maintenance: focusing on supplier management, unplanned downtime, and cost reduction. · Delays management: tied to narrowing the gaps between planned and actual arrival/departure times, rankings, and geospatial insights. As I said above, today’s key challenge for the industry is not measuring those individual subject areas, rather it’s in consolidating and interrelating them. The key is the ability to understand how an issue in one subject area affects an issue in another one, and to what extent. Are we done with challenges? No, we aren’t. Today’s competitive public transport market requires more than just consolidating insights. It also requires agility, meaning analysts must be able to consolidate insights in real time, to continuously compare their actuals against budgets and forecasts, and even to be able to adjust and simulate them while analyzing. We call this the closed-loop portfolio of monitoring, budgeting, and forecasting. And last, they need instant insights from massive data volumes; remember, they all use IoT devices – and we know what they generate. I used the SAP Digital Boardroom on top of in-memory platforms to analyze over 30 million records of public transport delays, incidents, and maintenance data. The SAP Digital Boardroom uses three touch screens to provide insights in real time on the transactional level. 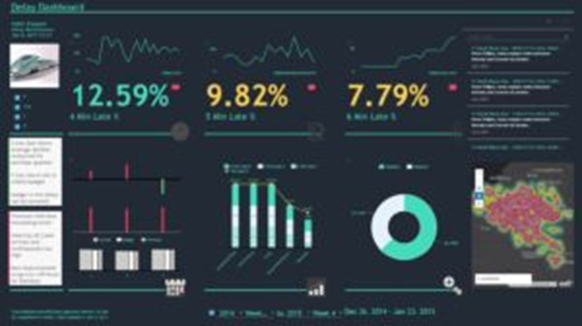 (This article describes how the SAP Digital Boardroom works.) What impresses me most is its ability to combine versions of actual, planned, forecasted, and predicted data; in other words, I can analyze, adjust, predict, simulate, and re-analyze the end result. Now we’re talking! It all starts with creating an agenda that lists the various insights required. The agenda items refer to models and stories with real-time insights. You can skip between agenda items with a single click, and every single insight can be further explored with new attributes, filters, or simulations. Watch the video below for a full overview of using the SAP Digital Boardroom to address the challenges I’ve described. Please be aware that I anonymized the data though the algorithms, structures, and “cadence” of the data from a real-world example. For more detail on the analysis, read Iver’s blog post, Part II-Public Transport:How to Get Insights on Repairs, Maintenance, Delays, and Vendors with SAP Digital Boardroom. This post has been syndicated from the D!gitalist Magazine and has been republished with permission.